This will export your product and category data in the file formats required for multiple data feed submissions for inclusion in their ecommerce search directories and shopping portals. 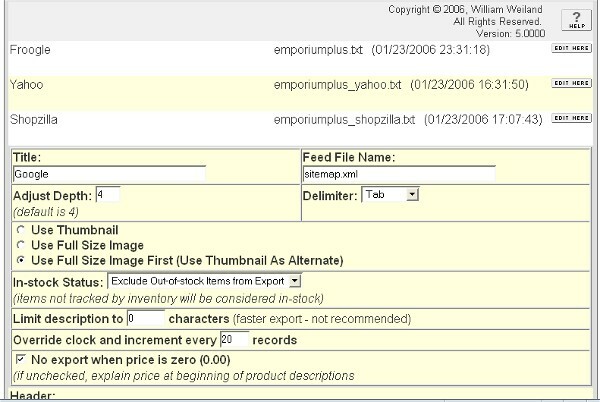 Template Data Feed exports your product and category data in the file formats required for multiple data feed submissions (Google Base (Froogle), Sitemap XML (for Google, Microsoft, Yahoo), Yahoo, Shopzilla, PriceGrabber, etc.) for inclusion in their ecommerce search directories and shopping portals. 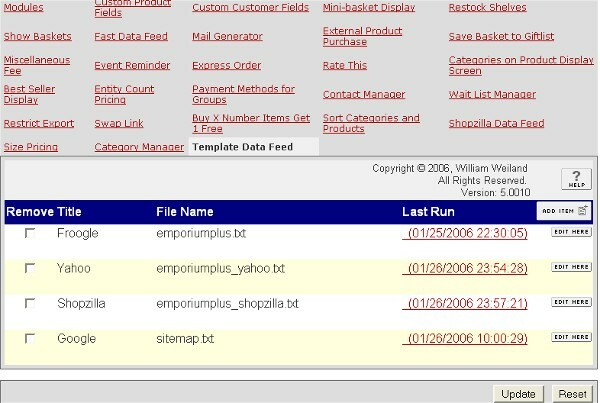 Using the template system, design the export for just about any comparison shopping engine (CSE). Improve your search engine optimization (SEO). Custom field data. If you are using Miva's custom fields module, the additional field data can be used to populate additional fields and/or added to the description. Ultimate feed submission tool, you can create unlimited feeds based on your search indexes' specifications fairly easy. Like our other modules, this module is licensed by domain, so if you have multiple stores in a single domain, you only need one license for all the stores in that domain. Once you get the customer to your site, use our Power Search module for your site's internal search tool. It enhances site navigation far beyond the built in search mechanism. If your host is web.com, you may not be able to use this module due to the way they configure their servers, i.e. not allowing exports. There are no known issues with other hosts. You spend a lot of time and money with hosting, entering data into your store, and improving the look and feel of your pages. 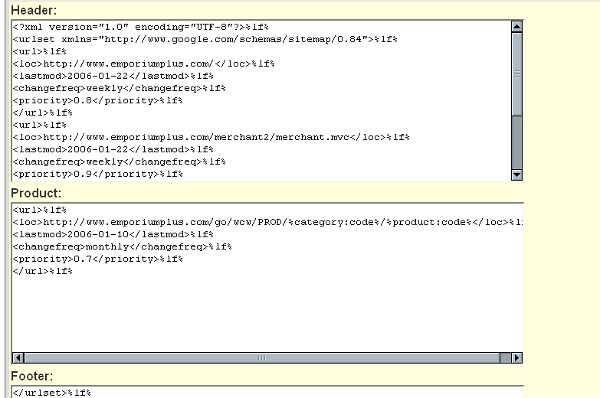 Why would you not want customers to find your site via search engines or shopping portals? You could submit your home page to them and hope all the pages get included in the search index. For better results, you need to submit datafeeds or hire someone else to submit them for you. Take a look at the comparison between the built in features and the alternatives. 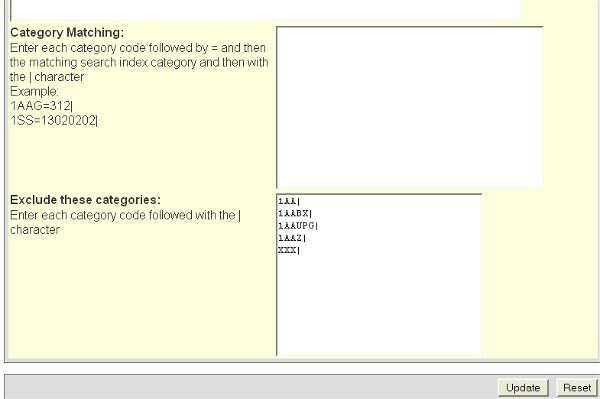 The answer is obvious, you need to improve your external search index interface. Most of the time you will find the Template Data Feed module does everything you need to increase traffic through well placed search index insertions. For the cost of dinner for two, you can make a significant improvement in your store's bottom line. If you have a few minutes a month to run the feeds and upload them, I doubt you'll need an expensive submission service. Compressed screen shots below are expanded at the slide show link on this page.